Upgrade to the latest version of Microsoft Dynamics NAV 2018 to enjoy the latest features and functionalities to improve your team’s productivity and efficiency. Dynamics NAV 2018 provides the latest ERP features & functionality and offers many advanced features not available in earlier versions of NAV. Thus, a migration will ensure that you will enjoy the latest features of Dynamics NAV 2018. The Dynamics NAV 2018 also ensures a seamless transition to Dynamics 365 Business Central (on premises/hosted edition) or cloud version. The deadline to upgrade to Dynamics NAV 2018 is 1st April 2019. Dynamics NAV 2018 can be integrated with Office 365 and other business applications. This will provide users with a comprehensive set of business tools with the familiar Office interface. For SMBs, this represents a complete business solution. Dynamics NAV 2018 incorporates Artificial Intelligence and advanced algorithms to support cognitive services and high levels of automation. Dynamics NAV 2018 interacts with Microsoft Flow. This enables users to create and automate workflows across multiple applications and services, improving productivity and efficiency. Users can customise their Dynamics NAV 2018 work space to match their job function and personal preferences to improve their productivity and user experience. Users can share data seamlessly between Dynamics NAV 2018 and their CRM (customer relationship management) system to ensures customer information is consistent across both systems. Dynamics NAV 2018 has simplified integration of third-party applications and services with a new feature for REST API. The interface provides access to 44 business entities covering core sales and financial information. To speed up reporting, users can now generate and preview content directly in Dynamics NAV 2018. Modification of the printing format in Dynamics NAV 2018 allows users to print three checks per page. Dynamics NAV 2018 incorporates a new option in the Business Manager and Accountant Role Centers – preconfigured Excel reports. Users can easily open and review financial statements created in Excel. Users can now submit longer EC Sales List reports with more than 9999 lines. 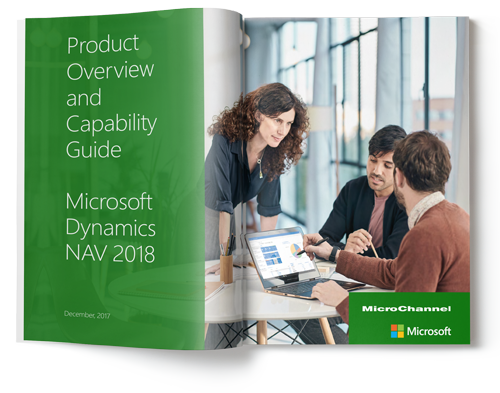 Below are the steps to upgrade from your older versions of NAV to the latest Dynamics NAV 2018. If you need further clarification, please feel free to contact us. Summary of the licensing for approaching end-of-life of Microsoft Dynamics NAV 2018 and key dates to note, as well as licensing options for Dynamics 365 Business Central.